January 22, 2018 – For the third year, Adams State University will offer the summer High School Apprenticeship Research Program in Artificial Intelligence and Robotics, funded by a grant from the Army Research Office. Interested high school students must apply for the apprenticeships by February 28, 2018. The application and details are available online. Use Adams State code HASU73. The apprenticeships are available to students who will be high school juniors and seniors in fall 2018. The $6,055 grant will allow two high school students to participate with faculty and university students in the Undergraduate Research Internship Program in Artificial Intelligence (AI) and Social Robotics, also funded by the U.S. Army. Both programs are directed by Dr. Matthew Iklé, Adams State professor of mathematics. The eight-week apprenticeship program will be held from June 1 through July 31, 2018. Apprentices will earn $10 per hour for 25 hours per week for 8 weeks, as well as one credit hour for the experience from Adams State University. “We are seeking students who have demonstrated interest and taken coursework in computer programming, software development, scientific reasoning, robotics, or some combination of these,” said Iklé, who will mentor the apprentices. “We will expect our apprentices to contribute ideas and suggestions to the entire team for experimental procedures.” Mathematics/Computer Science faculty members Dr. Comfort Cover and George Sellman will also participate in the research and guide students. In the research project, the apprentices will work on integrating previous work from two tracks: artificial intelligence and robotics. 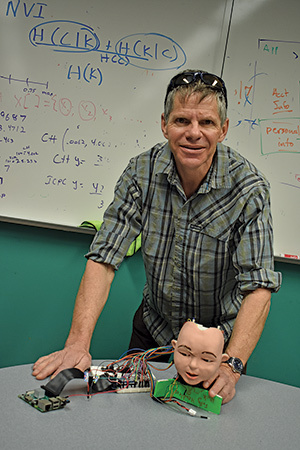 Researchers will work with the OpenCog Project artificial intelligence system, as well as with “Professor Einstein” robots in Adams State’s AI Robotics Lab. By working on this ambitious research project, apprentices will gain hands-on experience to strengthen their skills, learning abilities, and scientific reasoning. Iklé noted the apprenticeship program will also create a pipeline from high school to completion of a STEM (science, technology, engineering, mathematics) bachelor’s degree. Questions may be directed to Dr. Matt Ikle, 719-587-7791, or moikle@adams.edu.